The mistreatment of service dogs and their owners has been in the news a lot lately. Starbucks has felt the brunt of the negative publicity, after its Rochester, New York store denied entry to a woman and her service dog only a few months after a disabled veteran was denied entry to another store in Texas. A victim of the 2013 Boston Marathon bombing was also removed from a store for trying to bring in her service dog. The most egregious case recently was the example of a military veteran with PTSD who was thrown out of a restaurant for bringing his service dog, only to later be told by a police officer that he didn’t need a service dog since he wasn’t blind. 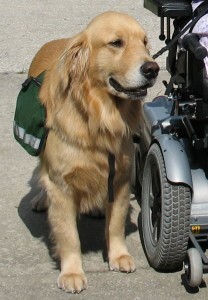 guiding people who are blind, alerting people who are deaf, pulling a wheelchair, alerting and protecting a person who is having a seizure, reminding a person with mental illness to take prescribed medications, calming a person with Post Traumatic Stress Disorder (PTSD) during an anxiety attack, or performing other duties. Service animals do not include emotional support animals. It is also important to note that “assistance animals” under the Fair Housing Act and “service animals” under the Air Carrier Access Act are more broadly defined, giving such animals broader housing and flying rights than they have under the ADA. Entities covered by the ADA must modify their policies to permit miniature horses where reasonable. The regulations set out four assessment factors to assist entities in determining whether miniature horses can be accommodated in their facility. The assessment factors are (1) whether the miniature horse is housebroken; (2) whether the miniature horse is under the owner’s control; (3) whether the facility can accommodate the miniature horse’s type, size, and weight; and (4) whether the miniature horse’s presence will not compromise legitimate safety requirements necessary for safe operation of the facility. 3. The ADA requires that all businesses, entities, organizations, or agencies open to the public allow service dogs to accompany people with disabilities onto their premises. The dogs must be allowed to go anywhere the public is generally allowed to go. Therefore, dogs may accompany hospital visitors into waiting rooms and other public areas, but may not go into operating rooms and other secured areas. 4. Service animals do not have to wear vests, patches, or other labels identifying them as service dogs. They also do not have to be registered, despite many private companies’ efforts to make a profit by encouraging people to purchase vests, register their service animals, or seek certification or ID cards. 5. Service animals are required to be under the control of their owners at all times. They must be leashed, tethered or harnessed unless the person’s disability prevents it, or unless such tethering devices interfere with the animal’s ability to perform its work. If a handler cannot gain control of the dog, or if the dog is not house-broken, you may refuse service to the animal and require the animal to be removed from the premises. 7. You may not charge an additional fee for service animals brought onto your premises, even if it is your standard practice to charge a fee for animals. This also applies to pet deposits charged by hotels or other businesses; any deposit or fee normally charged for an animal may not be charged for a service dog. However, if a service animal causes any damage, you may charge to clean or repair the damage, just as you would have if the patron had caused the damage. 8. Another patron’s allergy or fear of dogs may not be used as a basis to deny entry of a service animal. 9. Bars, restaurants, and other food sales or preparation companies may not refuse service or access to a person with a service dog, even if state or local health codes prohibit having animals on the premises. 10. You are not required to provide food or care for the service animal. If you have any additional questions, please contact ES Swanson Law!